"I'm in a bit of an avocado craze and, not being able to find a good deviled avocado recipe, I whipped this one up to go with turkey meatloaf for dinner. I hope you enjoy! You can substitute 2 teaspoons dried flaked onion for the 1/2 onion if desired. Top with hot sauce!" Scoop avocado meat into a bowl, reserving skins. 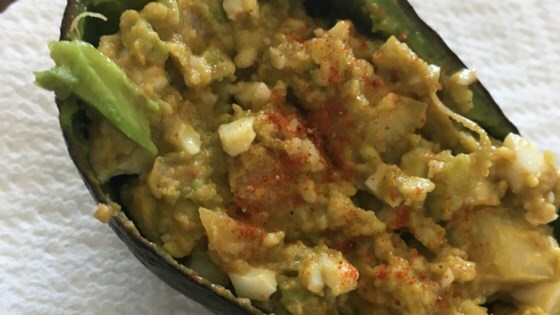 Mash eggs into avocado using a fork or potato masher. Stir onion, garlic, lime juice, paprika, cayenne pepper, salt, and black pepper into avocado mixture. Fill avocado skins with avocado mixture. I do not like avocados but I was looking for a low cholesterol snack this one is pretty good. I ate it with toast/crackers as a dip.